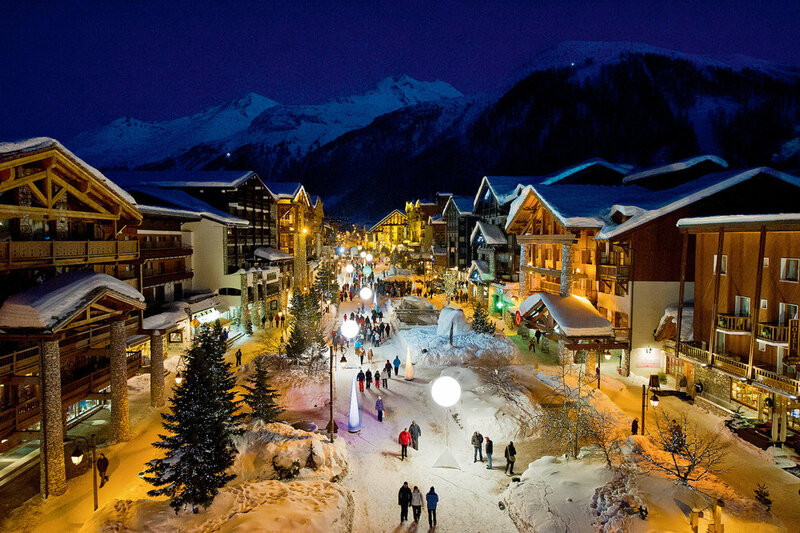 The European ski trip this year is going to be back to Val D’Isere, France. Tentative date is January 19, 2018 departure. The extension is going to be Lyon, France. It is where we will fly in to on arrival. Lyon is about a 2 hour bus ride to Val. I have been hearing for twenty years from travel brokers that we should visit Lyon so I spent some time online yesterday after speaking with two people who know about the City. Just to give you a start, here is some information about Lyon. FYI, it is about a 1 ½ hour TGV train to Paris, so for those of you who do want to see Paris, it is an easy day trip from Lyon. We also intend to stay in Part Dieu which is very much like the Temple Bar area in Dublin for those who went there. Situated between Paris and Marseille, Lyon is the largest city in France after these two. Lyon’s magical Old Town (Vieux-Lyon), a UNESCO World Heritage Site, its capital of gastronomy in France status as well as famous ‘Fête des Lumières‘ light festival makes it one of the most popular city in France to visit. Lyon is 2,000 years old and was founded by Romans. Since then the city had no major earthquake, fire or air strike so its historic buildings from Roman times to medieval buildings to Renaissance Palaces are still standing still and are original. Add the modern skyscrapers to the mix and you will have an architectural wealth you can only witness in Lyon on the planet. The most popular time to visit Lyon is during Fête des Lumières (Lights Festival) which was a local religious ritual but have become an internationally known large scale event in the past decade. For 4 days around December 8th, artists from all around the world display fantastic light shows and exhibitions throughout Lyon. With them, 4 million tourists flow to the city. So if you are not into Lights Festival, this is probably the time to avoid to visit Lyon since the weather will be cold, city and hotels will be packed and everything will be very expensive. Other than Fête des Lumières, some important professional trade shows like SIRHA (food, hotels and restaurants) and POLLUTEC (environment technology) also draw high number of visitors to the city and makes finding a Lyon hotel room very challenging and expensive. Lyon is 470 kilometers south-east of Paris and two rivers passes through the city: Rhône in the east and Saône in the west. Some important districts of Lyon are Fourvière hill, Vieux Lyon (Old Lyon), Presqu’île, Croix-Rousse and Part-Dieu. You can see these districts and their orientation in the Lyon map below. Here we will answer where to stay in Lyon question by introducing the popular and convenient districts among tourists to stay in Lyon. La Part-Dieu is the largest business and finance center in France after La Defense in Paris (Lyon is a major centre for banking as well as for chemical, pharmaceutical, and biotech industries) and is the second most important area in Lyon after Presqu’île. For people visiting Lyon for business, the focal point as well as the place to stay would be either Presqu’île or La Part-Dieu since most of the commercial centers are here. Lyon Part-Dieu Shopping Mall here is one of the largest shopping malls in Europe. Lyon-Part-Dieu Train Station in La Part-Dieu is one of the most important railway hubs in Europe. Even if you are not in Lyon for business, you can still stay here because the city has a fantastic public transportation network and it is easy to access other districts from here by public transport. Les Brotteaux hosts a large number of renowned restaurants such as the Splendid of Georges Blanc, a restaurant which is in front of the Est of Paul Bocuse. La Brasserie des Brotteaux is also an ideal place for those who like the Lyon’s culinary traditions. Vieux-Lyon is the oldest area in Lyon and with its 424 hectare area right under Fourvière hill, it is the largest Renaissance era old town in Europe after Venice. With its narrow, cobblestone medieval streets and 15.th to 17th century buildings once housing German, Flemish and Italian merchants (in the past the buildings in Lyon were the highest in Europe) offers a magical historic town experience to its visitors. Since the place is very crowded with tourists and many stalls catering to them, try to visit Vieux Lyon in the early morning and even better stay there if you are in Lyon for the history. Fourvière Hill to the west of Old Lyon is the place where Roman’s founded Lugdunum settlement, which will later become Lyon. Presqu’île is the hearth of Lyon and is the best place to stay in Lyon for visitors. Located between two rivers (Presqu’île means peninsula in French), the cafes, restaurants, luxury shops, banks, government buildings, museums, cultural centers and lots of historic buildings dot Presqu’île starting from Croix Rousse Hill all the way down to the point where the Rhône and Saône meets. For visitors as well as Lyonnais (residents of Lyon), Presqu’île is the center of economic, cultural and the night life in Lyon. The most important areas in Presqu’île are Terreaux and Bellecour. Bellecour and Hôtel de Ville at the north end of Presqu’île are the centre for high-end shopping, the National Opera and restaurants of all kinds and is home to Lyon’s top museums such as Museum of Fine Arts and the Museum of Textiles. The Place des Terreaux and Place Bellecour are here. Perrache to the south of Presqu’île was an industrial area to avoid until recently but is slowly transforming itself into a cultural area. Presqu’île is the heart of Lyon and is the “happening” place in the city. All Espace Killy 2 to 15-day passes* offer one free entrance to the swimming pool of the Aqua Leisure Centre. Partly cloudy. Lows overnight in the low teens. Sunny skies. Colder. High 23F. Winds N at 10 to 20 mph. Sunshine and clouds mixed. High 27F. Winds N at 10 to 20 mph. Be sure to join our Facebook Group as well. Certainly more posts and details there. Gateway Ski Club - Page shared a post. Found out this week that Rick Steves has published Podcasts that are to several spots near Naples, check them out here or by googling if you use Android. Download past episodes or subscribe to future episodes of Rick Steves Italy Audio Tours by Rick Steves for free. Gateway travelers here is a cool app to help with clearing customs. Copyright © 2017 Gateway Ski All Rights Reserved.